"Capt Texas Cav Mexican War"
- H M Childers, 59, [abt 1801], Tennessee, Episcopal Meth. CHILDRESS, Rev. Hugh Martin, Sr.
- United Methodist Historic Sites: United Methodist Clergy Marker entry "427 Grave of Rev. Hugh Martin Childress, Sr., Atoka Cemetery, west of Novice, TX"
Source Information: Ancestry.com. Alabama Marriage Collection, 1800-1969 [database on-line]. Provo, UT, USA: Ancestry.com Operations Inc, 2006. Original data: Alabama Center for Health Statistics. Alabama Marriage Index, 1936-1969. Alabama Center for Health Statistics, Montgomery, Alabama. Rev. Hugh Martin Childress married Susannah Watters 5 December 1823 in Perry County, Alabama. Rev. Childress was a Methodist minister, he served as a first lieutenant of the permanent Volunteer Company of Texas Militia under Captain Robert M. Williamson and in Colonel John Henry Moore's Battalion for 50 days in 1835. In 1836 he served as a private in the Ranger Corps of Mounted Riflemen under Captian John J. Tumlinson. 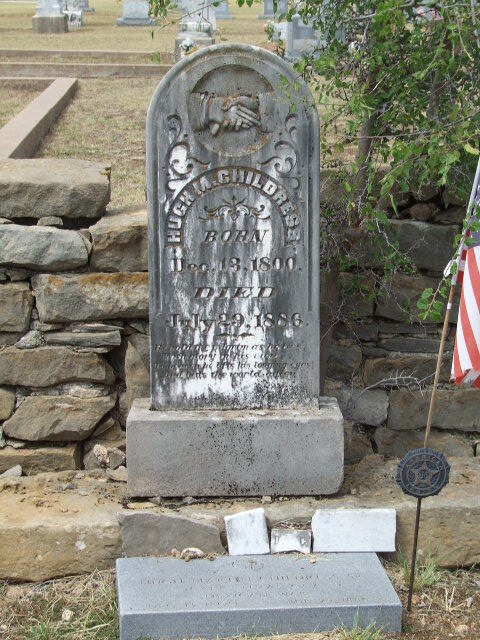 Captain Hugh M. Childress participated in the Battle of the Salado and in the Dawson Massacre, he received his final discharge on 20 August 1851. He was known as the "Bear Hunter Preacher." [S5] Atoka Cemetery, Coleman County, Texas Cemetery Directory, CHILDRESS, Hugh M., Sr - Dec 13, 1800 - July 29, 1886 - "Capt Texas Cav Mexican War" . [S24] Atoka.. Early Settlement: Charlie PARKER , by Jack Shields, "Mart" Childress. [S19] Texas Historical Marker, Atoka Cemetery Historical Marker; Texas Historical Commission: Historical Marker #232, 1996. [S36] CHILDRESS: Pirtle01 Family Tree @ Ancestry.com , Hugh Martin Childress; //trees.ancestry.com/tree/9185439/person/-841497089. [S10] FindAGrave, FindAGrave.com, posted in NOTES; also FindAGrave.com, posted in NOTES of wife Susannah WATTERS CHILDRESS. [S39] US Census, H M Childers; 1860 Census, Lampasas Co, TEXAS, Ancestry.com Transcript, posted in NOTES. [S39] US Census, Childress H M, Head; 1870 Census, Coleman Co, TEXAS, Ancestry.com Transcript, posted in NOTES. [S39] US Census, Hugh M. Childerss, Head; 1880 Census, Coleman Co, TEXAS, Ancestry.com Transcript, posted in NOTES. [S42] Marriage Record of Presiding Authority, Hugh M Childress; Alabama Marriage Collection, Ancestry.com Transcript, posted in NOTES . [S168] CHILDRESS: Cornelius, Morris, Riley, Allison and Related Families Linked @ Ancestry.com, Hugh Martin Childress Sr.; //trees.ancestry.com/tree/31043690/person/12355081083. [S39] US Census, 59, [abt 1801], Tennessee; 1860 Census, Lampasas Co, TEXAS, Ancestry.com Transcript, posted in NOTES. [S39] US Census, 70 [abt 1800], Tennessee; 1870 Census, Coleman Co, TEXAS, Ancestry.com Transcript, posted in NOTES. [S39] US Census, 79, [abt 1801], Tennessee; 1880 Census, Coleman Co, TEXAS, Ancestry.com Transcript, posted in NOTES. [S36] CHILDRESS: Pirtle01 Family Tree @ Ancestry.com , Birth 13 DEC 1800 in Davidson Co., TN. [S168] CHILDRESS: Cornelius, Morris, Riley, Allison and Related Families Linked @ Ancestry.com, Birth 13 Dec 1800 in Davidson, Tennessee, USA. [S39] US Census, 1860 Census, Lampasas Co, TEXAS, Ancestry.com Transcript, posted in NOTES. [S39] US Census, 1870 Census, Coleman Co, TEXAS, Ancestry.com Transcript, posted in NOTES. [S39] US Census, 1880 Census, Coleman Co, TEXAS, Ancestry.com Transcript, posted in NOTES. [S168] CHILDRESS: Cornelius, Morris, Riley, Allison and Related Families Linked @ Ancestry.com, Death 29 Jul 1886 in Coleman, Texas, USA. [S36] CHILDRESS: Pirtle01 Family Tree @ Ancestry.com , Death 29 JUL 1886 in Coleman Co., TX. [S35] MURRILL, PARKER, SLATE: Evelyn & Alvin Brown Family Tree @ Ancestry.com, Death-Novice, Coleman, Texas, United States -Burial: Atoka Cemetery, Novice, Coleman County, Texas. [S25] Handbook of TexasOnline, The.